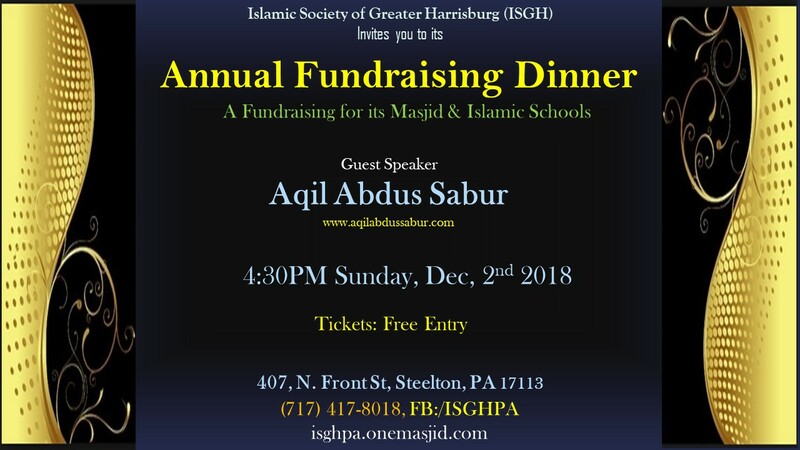 ISGH would like to cordially invite all the Central PA families to our year end Fundraising dinner at ISGH (Islamic Society of Greater Harrisburg) on Sunday, December 2nd, 2018 at 4:45PM, In Shaa Allah. These donations will go in supporting Hifz/Cyber/Evening School and towards maintaining our large complex so, we strongly encourage you to attend and donate. Your participation is very important to us in making this fundraiser successful, and we look forward to see you there and helping us in our efforts. All the tax donations to ISGH are tax deductible. Those who cannot attend please click on the following link to donate Donate To ISGH . For any queries please e-mail arizwan@hotmail.com. Please pass this information to all those you think would be interested. For the past thirty forty years, Br. Aqil has been active in Islamic work in Philadelphia and the United States. His activities on behalf of the community involve dawa, Islamic finance, zakat, and community development activities. From 1978-1982 he served as the General Director of the Islamic Center of Philadelphia. During the period 1991-1994 served as Amir (president) of the Majlis Ash Shura of Philadelphia and the Delaware Valley. Also during this time he served as Amir of Jamaat Al Ikhwan, the original group of families that founded the Germantown Masjid. From 2001-2003 Br. Aqil served as the Amir of the Shura at Masjid Al Jamia in Philadelphia. There he led the effort to strengthen the mosque’s religious activities with the appointment of an Al Azhar trained imam, management and finances. In addition, during the period 1986-2009 he took an active interest in the fields of Zakat and Islamic finance. He conducted research with many scholars and Islamic financial institutions in Saudi Arabia, the Emirates, Kuwait, Bahrain, Egypt and Europe. He is one of only two American graduates of the Integrated Islamic Banking and Finance course held in Malaysia in 1994, and he has been a regular participant at the Harvard Islamic Finance Forums since 1997. Professionally during this same period, Br. Aqil has been involved in small and mid size business development, managing economic development organizations. He formally served as the Executive Director of Pennsylvania Minority Business Development Authority (PMBDA), the Executive Director of the West Philadelphia Financial Services Institution (WPFSI), and president of the Philadelphia Commercial Development Corporation (PCDC). Br. Aqil has participated in a number of trade missions to the Middle East and the Gulf area. He assisted in the creation and expansion of countless small and medium sized companies, and a number of financial institutions including banks, venture funds, micro finance funds and credit unions resulting in at least $300 million in projects. Working with a team of committed Muslims, Br. Aqil led the effort to obtain a license for an Islamic credit union in 1994, which expired in 1997. There is a new effort to obtain the license in 2019. He currently provides ongoing seminars to assist the community in officially establishing the obligatory Zakat, and increasing community awareness of the benefits of Islamic finance. A native of South Philadelphia, Br. Aqil attended the Wharton Evening School at the University of Pennsylvania and is a graduate of Antioch University.